Specifications: LCD 10.1 "TFT (1 920 x 1 200 pixels), Android 4.1 Jelly Bean, 8 + camera 2 megapixel, 6 000 mAh battery, certificates IPX5 / 7 and IP5X. While the number of producers trying to cut costs and compete in low price, Sony ensures high functionality and gadgets. 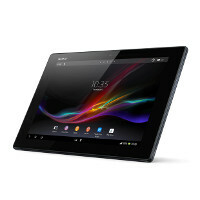 The Xperia Tablet is not only efficient components and a stylish, elegant form. It is also a set of modern sensors, a comprehensive suite of software and certificates IPX5 / 7 (water resistant) and IP5X (resistant to dust), so that the new Z-ka is a truly versatile equipment. The possibilities, of course, goes high price - especially if you decide on a version with 3G modem. Remember that entered PIN on the website must be exactly the same as PIN entered in the setup program on your Sony Xperia Tablet Z.